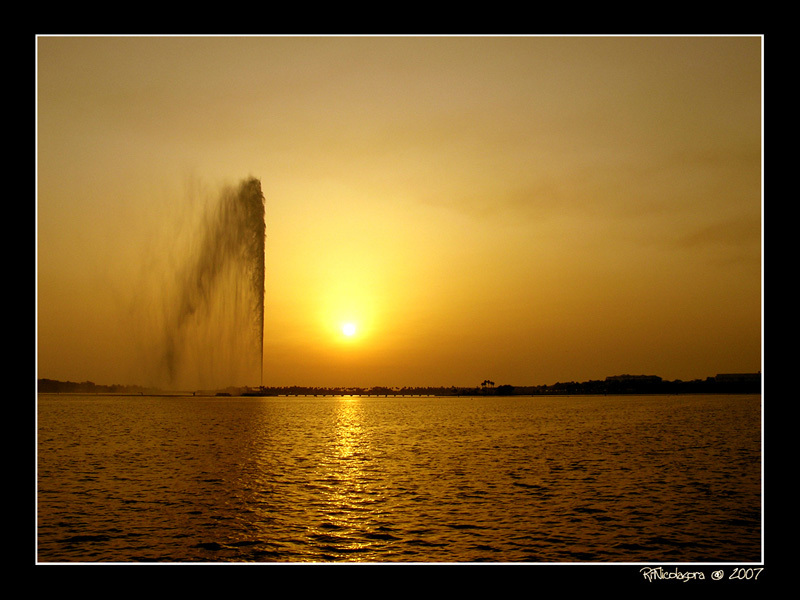 King Fahd's Fountain (Arabic: نافورة الملك فهد) Jeddah's fountain (also called King Fahd's Fountain) which dominates the city�s skyline today is the second one built as a landmark for the city of Jeddah. Both within the official Salam Palace perimeter (Administration palace of Saudi Arabia). The first structure, built between 1980 and 1983, was very much in the style of the freshwater fountain in Lake Geneva, the Jet d'Eau, which reaches 140 meters (460 ft) and lofts about seven tons of water into the air at any one moment at a nozzle speed of around 200 kph (124 mph). Astonish capture. Very Very nice Capture. Good timing as well for this action shot! Well done. Interesting shot and I like the lighting. Well done. A new rich and impressive sunset! Marvellous colors and composition with a great sharpness and a beautiful presentation. Impressive picture! Very well composed and sharp! Great notes! TFS! The light is spectacular, very well metered and controlled, with good placement of the horizon along the rule-of-thirds, and excellent placement of the fountain itself. What kind of velocity must the water be at, to spout so high?? Wow golden sky.I think that is oil coming out sayang.Nice scenery.Tfs. Aha! One of Jeddah's most famous attractions. Nice shot Tito, and you chose the right time of the day to make this.